Just some of the companies we have supported and worked with over the years, if you contact any of them please mention our name, you never know it may get you a good deal! 7.5% discount on your motorcycle or scooter insurance just for training with ART. 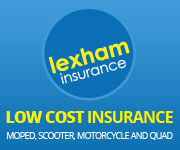 Lexham Insurance also offer an introductory discount after any on road training with ART, try them too. Destination Ibiza Motorcycle Tours are run by fully qualified ART Instructors to ensure safe group riding across Europe. ART are a Suzuki select training school, who are able to offer approved training for Suzuki £99 insurance deals. ART are an approved Ducati training school able to offer training on the latest Ducati models, please ask for details. Wheeldon farm off road school, we can't recommend these guys highly enough for all off road training. ART are Corporate members of the Motorcycle Action Group, helping to preserve riders rights since 1973. Overland Magazine, The ultimate coffee table motorcycling adventure book. Go on take a look! The best trackday instruction this side of the pond, run by Andy Ibbott and his team. Bike Channel, home of all the best motorcycle videos on the internet. ART are proud to work with Rainbow Trust, family centered caring for children with a life threatening or terminal illness.